You can get your own Things In My House Thursday button here. Thanks, Muddy, for making the adorable button! My contribution for today are two things that I love that were given to me by someone I have never met in real life...From an internet friend...A Swappie internet friend. On the Swap, we have swaps several times a year. We have swapped mugs, kitchen towels, refrigerator magnets, and ever year we swap Christmas ornaments. A few times, the Swappies decided to swap fat quarters. You quilters will understand what they are. The baby blanket was made for me by my Swappie sister, Bridget. She made it several months before Brooklyn was born and placed for adoption. She wrote in the card that she prayed for me and for Brooklyn while she made it. I use it on my office desk as a table cloth. I wanted it to be on display. It's too precious to have folded up and put away. Here is the card that Bridget sent with the blanket. I recently framed it to hang in my office area. I hope you can see it well enough to see that the sheep's body is the written words of the 23rd Psalm. I LOVE quilts, and I know how much work they are to make; this was an incredible gift. I really like the idea that you use it as a tablecloth; I'd never have thought of it, but I feel free to steal the idea now!! The sheep / Psalms card: are you kidding me? Beyond perfect. So meaningful and appropriate. Thanks for participating! I look forward to your ''things'' ! 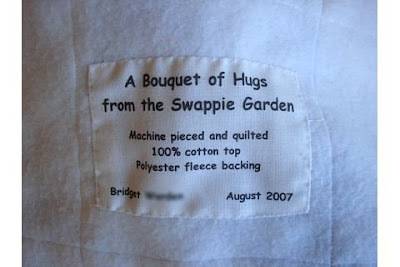 I remember Bridget making that for you. It was such a precious gift. The card is wonderful. Did she know of your love for sheep at the time? I love the card-what a neat idea. I missed this post originally. 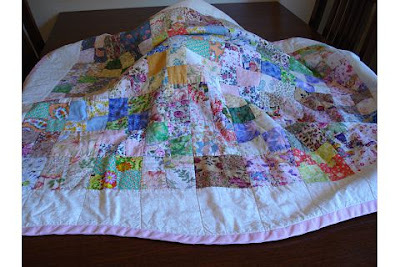 The quilt is beautiful, and Bridget has a heart of gold!